After high school, I spent a couple summers interning at an architectural firm in Fairfax, VA. Mostly, I was tackling "redlines" (corrections on blueprints) which is generally speaking, horribly boring, tedious work. The best days were those when I was allowed to help their resident artist with architectural renderings. 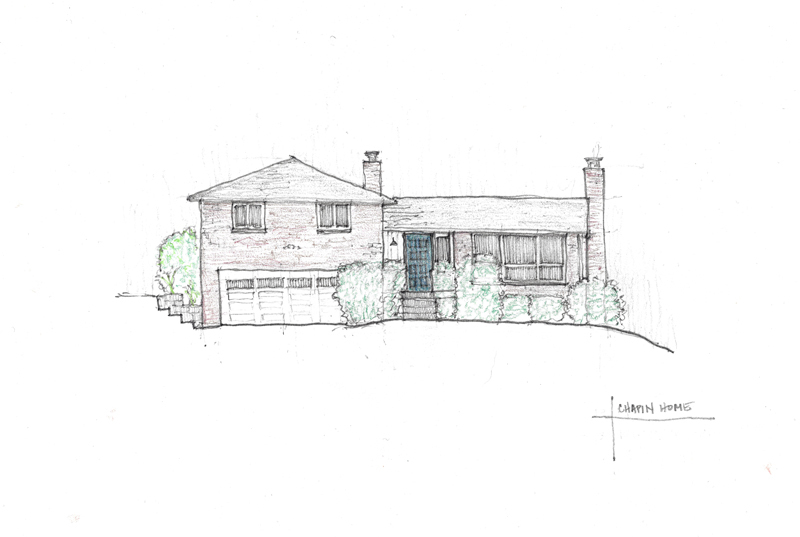 He would tweak home elevations in CAD, print them, and then color them in with fancy markers. When I got to help, he would let me color in different elements of the facades, coaching me on color selection and technique. It absolutely blew my mind that I could be paid to sit and color. Lately, I've been pondering the idea of selling custom home renderings on Etsy, but am still having trouble wrapping my mind around the fact that anyone might ever again pay me to color. It just seems too good to even be possible. In the meantime, I've been focusing a little on just drawing for myself, meditating on a few important places from my present & past. My first is a drawing of our current house (obviously a very meaningful place! ), drawn freehand with a standard #2 pencil and rendered with color pencil. Something I enjoy about drawing architecture is that the artistic process enhances my understanding of the building design. When I draw an elevation like this, I first break down the geometric proportions of the building through the use of lightly drawn guidelines. Rather than erase them, I keep them as a layer on the page. As I continue to darken and fill in the page, the drawing becomes a palimpsest (n: something reused or altered but still bearing visible traces of its earlier form). Just as the drawing is a palimpsest, so is the home - a place that will change over time but retains the memory of those who have been there. The second depiction - a home that my grandparents built in Locust Grove, VA, and a favorite place from my childhood. The third drawing - a place that I passed often during my years at the University of Virginia, the Chapel. Though I only worshiped here a few times, I find a lot of meaning and irony in this architecture. At minimum, it's been fun to practice some mindfulness through these drawings. Whether I will ever get paid for them or not, time will tell.